And one learns to "accept" the warnings , even EW has to live with them. Thanks for the link. I see he DOES have BOTH the x86 and AMD64 versions. What I DON'T know is if he built them under pure Debian or a 'buntu flavor. The only possible problem might be compatibility between Debian and Ubuntu. *SOME* Debian packages are NOT compatible with Ubuntu (and visa versa) even though they are BOTH .deb in structure. I'm running Linux Mint which uses the Ubuntu repository for most packages. Naturally the mix of libraries is part of the issue, so when unsure it's better to just build it from source on the system where it will be used. (No, I'm NOT a 'BSD fan). What I DON'T know is if he built them under pure Debian or a 'buntu flavor. Cliff didn't build them at all - I just let Carsten (Bingo) upload the files he builds to my webspace. Until now i have only used Ubuntu LTS to build the .deb packages on Cliff's page. At some time i begun to indicate the build distro in the packagename. I use Virtualbox , for the buildhost systems. And at the moment i still have an Ubuntu 10.04 installed in a 32 bit engine , and another in a 64-bit engine. Btw: The "Special Static" was build with the "real" winavr-2010 patches , and even though it's build under U-8.04. It might work under a 10.04. Atm. i don't have a Ubuntu 12 installed , so there isn't much i can do. Hmmm, well I'm running Linux Mint 13 64 bit, which is based on the Ubuntu 12.04 repositories. I can't download the script. Given that Atmel have a 4.7.2 pre-built for Linux is there really any point? It's great to have such a script. I have a feeling that the patches for the 4.5.1 script , on the freebsd server has been taken down. I have included the patches in the 4.5.2 zip file. 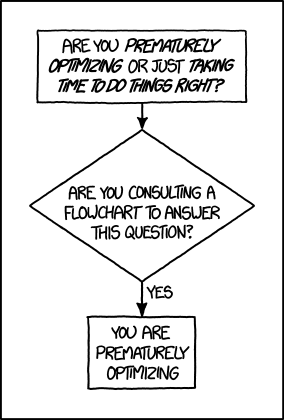 So skip the get-patches.sh step. I have updated the buildscript in the first post to use that one. The previous script is attached here (if anyone still wants 1.8.0) , note i haven't tested it on Mint17 (Ubuntu 14.04). I had to test the new avrlibc-1.8.1 , and Cliff wanted to use _flash etc. So avr-gcc 4.5.1 won't do. Use : avr-size for displaying the "old size info"
Use : avr-size   for displaying the "old size info"
I'm trying to use your script to build only avr-gcc + avr-libc. make: *** No rule to make target `../libiberty/libiberty.a', needed by `full-stamp'. Stop. I still get the above build error though. Any ideas what I need to do to get it to work? I also just tried adding binutils to the build (binutils-2.24.tar.bz2), and I still get the same error. ./config usually produces a log file that reveals any issues. configure: error: gmp.h cannot be found or is unusable. 1: Have you looked in the "pre-reqs.txt" ??? There was no such comment for GMP & mpfr, so I thought they weren't required. Reading the gnu docs makes it clear that they are required. I added back GMP & mpfr to the get-files and build scripts, re-ran the get-files, and am running the build script as I type this. The problem is the script assumes the basename of the gmp archive (gmp-6.0.0a) is the name of the directory created when the archive is extracted. However the directory name in gmp-6.0.0a.tar.bz2 is gmp-6.0.0 (no 'a' suffix). I manually copied the gmp source files and re-ran the build script. That seems like a sensible explanation to the error , and yes the immediate cure would be to manyally copy the gmp source files , or to extract the gmp sources , rename the directory to the "a" name , and repack it. I'm probably not going to update the buildscript , as it's only a few capable people using it today , and i expect that they can do the same reasoning as you. Ok, I'm game, where does one start to get AVR 8 support with ATA6614Q device? I downloaded the Linux stuff from Atmel and found the headers have the device but it looks like they are at version 4.81, if I'm going to battle this I should at least use the latest source. The WINAVR stuff is not they answer, it appears the supported devices stopped a few years ago. I tried AS 6.2 but it doesn't respond well to my Windows 7 x64, Windows 10 x64 appears to be functional but that is a beta setup, not production and AS 6.2 does not have git. I still have to read the stuff from Atmel, that might answer a few questions. For latest Atmel device support you are (currently) better off sticking to Atmel builds. So while 4.9 may look enticing I'd just take Atmel's 4.8.1 and use that for the time being. Atmel haven't released a toolchain for a while so I rather suspect they are waiting for the 4.9 dust to settle and we may see one shortly anyway. They are working (see the check in history at the AVR-LibC repo and all the activity from Atmel employees) to push their private changes for added device support back upstream so the generic build will mirror their own local build at which point it won't be necessary to have an Atmel one at all - but that's still work in progress and until then the Atmel builds remain the best option - especially for "none mainstream" devices like the one you want to use. 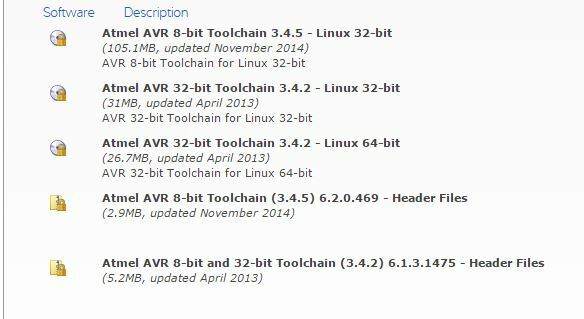 I can't find the AVR8 linux x64 tool chain. Target binary, dcp extraction not possible. Cannot find the target. This lack of Linux 64 is very annoying. Surely they have a build script that just pumps out all versions at the same time? I'm certain it has already been built. Rather it's the website which isn't properly updated. I sort of assumed the posting on the website might be part of the auto-build process. Perhaps that last step simply does not work for some reason or maybe it was that the build of the AMD64 version did fail for some reason? Last but not least, where do I put the header files? The file structure seems to be vastly different for each build of the AV tool chain, the Eclipse AVR add in can't find them. Oh, Eclipse on Raspberry, that was a trip. Last but not least, where do I put the header files? The avr-gcc etc are in ./bin and the base of the includes are at ../avr/include/ from there - that would be the directory with stdio.h and so on. Then all the AVr specific stuff is in an ./avr/ from there (that is ../avr/include/avr/ from the ./bin/) which is why io.h is referred to as <avr/io.h> in AVR programs. To be honest I don't know why you don't just get the .tar.gz from atmel.com and unpack it (though I understand the current issue with no linux64 build). Eclipse on Raspberry, that was a trip. Had to give up on AVR Linux, the tools are 4.81 and the Eclipse AVR add in does not pick up the arv/io.h file so it will not allow selection of a MCU. I did a git and found where he was parsing the directories but couldn't figure out why it was failing. Atmel Studio 6.2 (AS) on Windows 10 was working until they installed the latest build, it killed all the USB drivers, didn't like them, they were not branded by Microsoft so they killed them. Several application from the 'Store' died too so Atmel is not alone. I restored a snap-shot of my Windows 7 workstation system before I installed AS and installed AS again, after it installed the first time I ran it AF told me it had an update, 100mb or so later it was install and now AS on Windows 7 x64 is working. Here is the deal: gcc 4.80 ~ 4.82 are known to be faulty, the current compiler for AVR8/32 is gcc 4.81 for ARM 4.84 so is it safe to use 4.81 on an AVR8 device? I would go back 1970 and command line everything like the good old days of masm using ed but I'm getting lazy in my old age. so is it safe to use 4.81 on an AVR8 device? Yes but note that ALL compilers have bugs. GCC is pretty good with its release schedule so some get fixed quite often but 4.8.1 (and 4.9.2) will have bugs. You just have to hope (as with all compilers) you don't hit one that affects what you happen to be trying to do at the time. Having said that I consider 4.8.1 from Atmel's build to be pretty stable. Well, this building script seems to work good on a RPi : it takes hours, but generates avr libraries. However, there is a small flaw: usually, prefix is used to denote the directory where the results (compiler, gas, libraries, doc) will go : it may be in a small disk; the place where one builds (huge amount of *.o, ...) can be in a separate disk (it is cleaned after building, but it eats disk space), at least in a distinct directory. This does not matter with usual disks, even USB keys -one can install x86 - GNUlinux on a USB stick now-. But RPi "disk" is a SD card : it is expensive (twice as USB sticks), and maybe wear out : seems a bad idea not to separate the building directory trees from the installed one. fyi, there's a creation using the Raspberry Pi Compute Module that contains a 1TB SATA laptop hard disk. In the following, go thru the Kickstarter link. Well, thanks Chapman for the information. I knew that one can use an external -USB- rotating disk (price per GB is very low) -one can even boot from it, only the FAT part of the SD is mandatory- but it is not a standard configuration, doubles the price and makes connectivity complicated . I got avr-gcc compiled on an external -250GB, in 3 parts- USB HD but I cannot -maybe a copy works, if generated compilers /libraries are directory-tree independant...- put it into the SD as directories to download sources , directories to untar and compile and result directories are in the same tree denoted by "prefix" (I did not try to fix it with mount points during buils, as it is not standard). Then rm the symlink, and copy the <usb-disk avr dir> to /usr/local/avr. I'm just building on a 16GB Sandisk Ultra Class10 card , and that's it. The wear is neglible as most files are written once , and read many times.